Koncept Manager Desk uses space efficiently and includes multiple drawers and shelves. With a work area of 5.75 feet width and 1.6 feet depth, the desk has a dual colored hazel and white, thick textured lamination top and a side rack with soft closing drawer channels. Now work in style with Interwood’s new range of smart executive desks that reflects your personality. Equip your office with sleek and proficient design that maximizes opportunities. Pure Manager Desk is hefty yet adjustable with multiple storage shelves; ideal for the banking sector. The desk is 6 feet wide and 1.6 feet deep, made in white textured lamination with a thick tempered glass top. 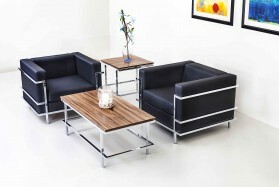 It has metal legs with chrome finish and an optional extension of 3.2 feet working area. Now work in style with Interwood’s new range of smart executive desks that reflects your personality. Equip your office with sleek and proficient design that maximizes opportunities. Ozone the most preferred range, beautifully finished with PVC tough edge on all exposed edges, range also includes workstation’s storage, meeting tables and desks with manager desks, ideal for use in small offices; it contains its own filling cabinet to keep folders important files on their right places. A contemporary design, with an extension, giving an innovative look to its luxury. Rove set range is designed with veneer in Jacobean finish with metal coated base. Studio Manager Desk is dynamic, adjustable and space friendly. It is 5 feet wide and 3 feet deep. With a white painted, thick tempered glass top and MDF structured vanity, the desk has chrome finish legs and an optional extension of 2.6 feet working area. Now work in style with Interwood’s new range of smart executive desks that reflects your personality. Equip your office with sleek and proficient design that maximizes opportunities. 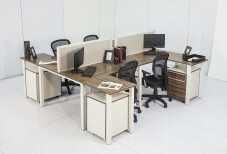 The FLO workstation in grid style is designed with high quality laminate finish, the range is offered in white color, it includes storage, meeting table and Manager Desk. It has generous workspace for working with separate LCD arm and CPU unit freeing up your legs. Sofas are contemporary designed, structure is made up of solid acacia wood with black leatherette and legs with chrome finish. This sofa is offered in single, two & three seater. A mix of classic elegance with highest quality products in vantage yet luxurious style. 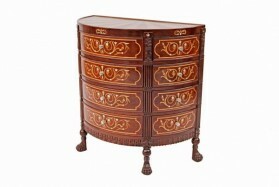 Its Mahogany wood & veneer of Mahogany finish gives it a beautiful shine.